Indian Prime Minister Shri Narendra Modi has dropped the Maldives from an upcoming tour of Indian Ocean neighbours. The Indian Ministry of External Affairs announced in a statement yesterday that the prime minister would visit Seychelles, Mauritius and Sri Lanka from March 10 to 14, but gave no explanation for the omission of Maldives from the itinerary. The cancellation comes amidst nightly anti-government protests and heightened tension sparked by the arrest and prosecution of former President Mohamed Nasheed on February 22. “The dates for the visit were being discussed between the Maldives and India and both countries have decided to postpone the visit to a later date to give more time for both countries to prepare well for the visit. New dates will be announced once finalised between the two countries,” reads the statement. President’s Office Spokesperson Ibrahim Muaz Ali insisted that there was “no connection between Nasheed’s trial” and the postponement. However, President’s Office Minister Mohamed Hussain Shareef ‘Mundhu’ told the Associated Press (AP) that Maldives had been on Modi’s itinerary and the country had made extensive preparations for the maiden visit. “He says India was not more specific,” AP reported. Local media had reported last month that Modi was due to visit the Maldives on March 15 during the regional tour whilst Foreign Minister Dunya Maumoon announced the trip following a meeting in New Delhi with External Affairs Minister Sushma Swaraj. “The people of the Maldives will always welcome the Prime Minister of India to the Maldives. The MDP regrets the authoritarian actions and confrontational nature of President [Abdulla] Yameen that has resulted in the Indian PM Modi cancelling his first visit to the Maldives,” said Spokesperson Hamid Abdul Ghafoor. Indian media reported diplomatic sources as saying that the Indian government did not want to be seen “involved in domestic issues” of the Maldives. “Sources said the government was taken by surprise over the treatment of former President Mohammad Nasheed, who was arrested and charged with treason and roughed up by the police on the way to court,” reported The Hindu newspaper. A day after his arrest, Nasheed appeared in court for the first hearing of his trial on terrorism charges with his arm in a makeshift sling after police manhandled and dragged the opposition leader into the court building when he attempted to speak to reporters. “But our concerns haven’t been heeded, and in this situation it makes little sense for the Prime Minister to visit,” a senior Indian official told The Telegraph. The Telegraph meanwhile quoted a second Indian official as suggesting a Chinese role in the recent developments. “Without a concrete commitment from the Chinese, there is no way the Maldives would take on India the way they have,” the official was quoted as saying. “China upholds the principle of non-interference in other countries’ domestic affairs. 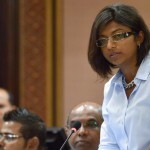 We believe the Maldivian side can deal with its domestic affairs properly,” he said. Foreign Minister Dunya had meanwhile dismissed statements expressing concern with Nasheed’s prosecution by the Commonwealth, India, Canada, UN and the EU. “The Government of President Abdulla Yameen Abdul Gayoom will not take instructions from a foreign government on any issue in governing the country,” she declared. In his address to the nation on the occasion of Republic Day (November 11) last year, President Yameen slammed “Western colonial powers” and declared his administration was “looking East” towards China. That uneducated Dhunya would come again and start telling hocus pocus. She should be doing some Geology.
""" President’s Office Spokesperson Ibrahim Muaz Ali insisted that there was “no connection between Nasheed’s trial” and the postponement. """ Reminds me of Saddam's Information Minister Muhammad Saeed al-Sahhaf during the Gulf War. "There are no tanks in Baghdad" he said as the American tanks were roaming around the city only a 100m from where he was. Muaz Ali is the al-Sahhaf of the Maldives! Dr Shaheed, Dr. Farahanaz, Mr. Zaki, Naseem and Shahid. Anyone who wants to career at future foreign Ministry needs to follow their twitters... which of course speaks volumes about the character of these people. One has to be a thoroughbred 'royal' from Male. Period. Also a certain kind of refinement of like the subtlety of Château Mont-Redon is a must. So pleased NaMo has given you the elbow. Who the hell wants to visit an unstable country where there are daily riots and where the former prez is manhandled, stripped and dragged through the streets by a bunch of politically motivated thugs? The TV pictures are embarrassing to watch. Like I said.....no class, no dignity, no shame. Thugs parading as presidents and ministers of a nation with their clumsy manoevrings - its time someone put the Banana Republic in its pokey place and snubbed them. They really have got too big for their boots: look East, but the East won't look at you for long either.. they too have bigger fish to fry.